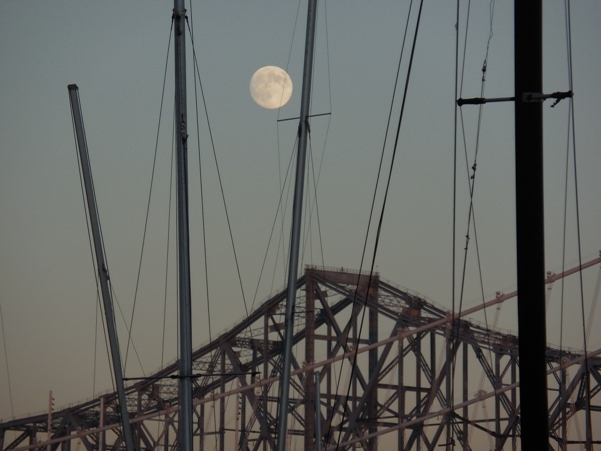 Last Sunday wasn’t a full moon night, but it was close. 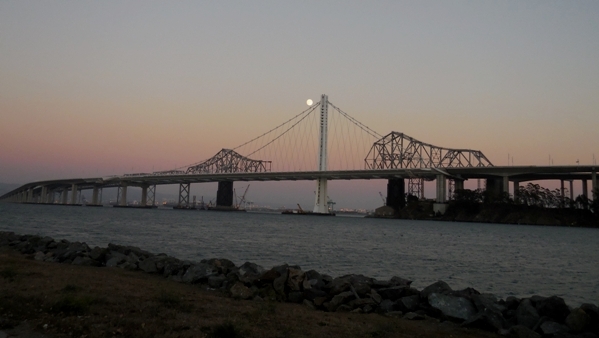 I found myself on Treasure Island at sunset, viewing the rising moon above the new bridge. The old bridge, with a gap where a span’s been removed, lay behind. I wasn’t the only one who was fascinated by the sight; there were perhaps half a dozen photographers out there, mostly with fine cameras, large lenses, and tripods. My camera is my trusty Nikon Coolpix. It lives in my pocket or my purse. 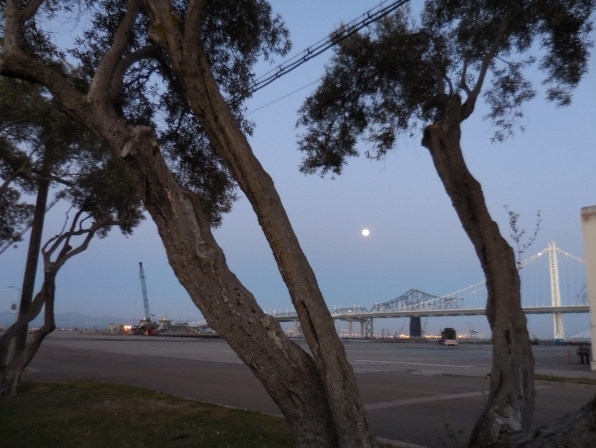 But whatever the camera, it was hard to go wrong on such an exquisite evening. 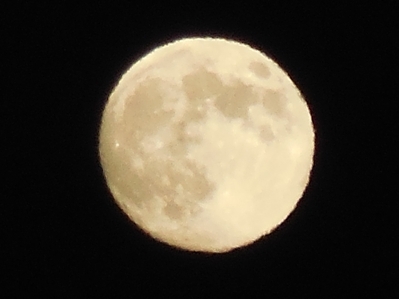 In fact, in some ways it’s easier to get a moon shot on a not-quite-full moon night. It’s a little less overwhelming for the camera. 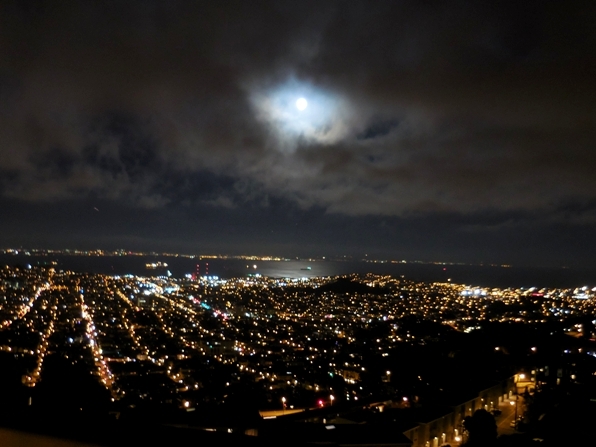 The next night was the Supermoon – and the clouds rolled in to San Francisco. But still, I got a shot from nearby Twin Peaks. 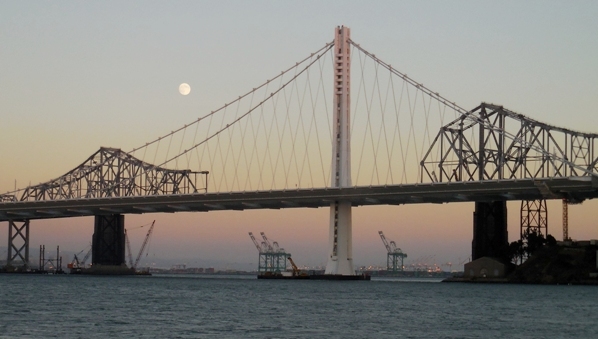 I’d hoped to get one behind Sutro Tower, but the alignments didn’t work out. Another night, another time. Beautiful pictures–Thank you for the post. These are each lovely, though my favorite is last. Thanks for being so observant and sharing your talent with your readers. It’s such a delight to get your missives! Super photos. What a moon!